I was seriously blown away by all your suggestions for ways to enjoy carrots. 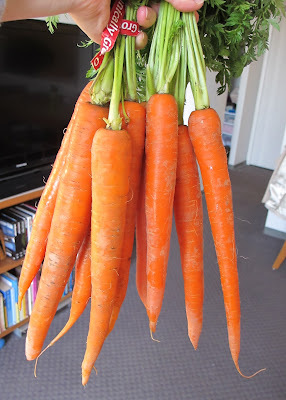 As I mentioned on Tuesday, we have a boatload of carrots in our fridge right now. You have all inspired me with your comments! Liz loves to dunk them in hummus, peanut butter & pumpkin butter. Debbie is also a fan of peanut butter! Kaitlin is a fan of roasted carrots - as well as mixing them into baked goods. Elin made Black-Eyed Pea Carrot Burgers last weekend - yum! Dipped in hummus & roasted with a little cinnamon are Erin's favorite ways. Ranch dressing? You got it, Tracey and Design Wine & Dine! Yelena likes cooked carrots served with honey and butter. You had me at butter! Add three more points for hummus - Natalie, Sarah & Gina love it! Jenn is a smart lady: carrot cake! Simply sauteed with olive oil & spices - great idea, Mandy. 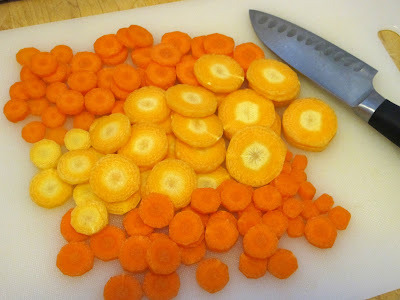 Kelly shared a recipe for Honey Glazed Carrots. Roasted carrots are loved by Grace & The Fit Academic. Kayla shared this carrot cake recipe by Chef Katelyn. Stephanie suggested a shredded carrot & raisin slaw. Y'all know raisins freak me out in baked goods, but I think I might like this! Sarah found a recipe for Carrot Bread on Eat Live Run. Carrot Cake Oatmeal - love it, Angela! Alyssa had an idea of using carrots in sweet potato cakes - creative! Have any carrot recipes to share? !